I have been wanting a 1st Gen. 2wd Blazer since before I got my license. 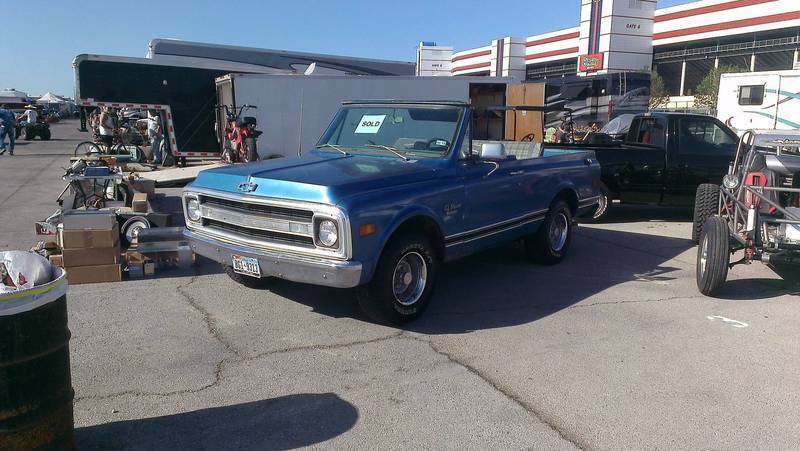 At the time I had my Grandpa's 68 C-10 and figured I would never sell it though. I did sell it while I was in the Army, so after I came back home I decided to start looking for a Blazer. Trucks are way easier to find around here so I picked up a 1970 C-10 and started doing the usual stuff. I did end up buying a 1970 2wd Blazer body with a title, but that project hasn't ever seemed to get off of the ground. Then the C-10 build got serious and I tore it apart to start building my ultimate vision of a truck. It was 5 years ago that I was able to drive it last. Hanging out with all of my Louisiana Classic Truck Club buddies, I really started missing having something classic to drive. 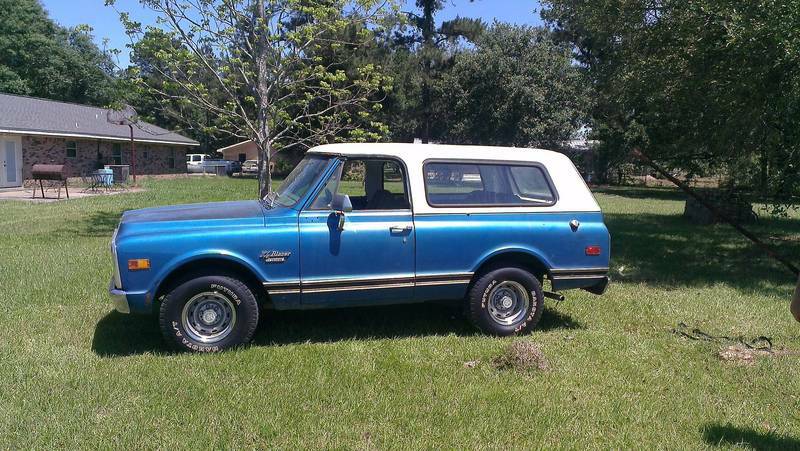 While driving to work in Texas one day I spotted a 72 4x4 Blazer for sale on the side of the road, so I stopped in to take a look and post it up to see if anyone else was interested in it. My loving wife, who knew how much I've always wanted a Blazer, told me that she wanted it for herself, knowing that she just convinced me to spend the money and not talk myself out of it. I brought the 72 home and devised a plan to convert it to a 2wd using a SWB truck frame, so I began collecting parts. Now that I have just about everything that I need, we make a trip to the Pate Swap Meet this past week and as I rounded the corner, I saw it. 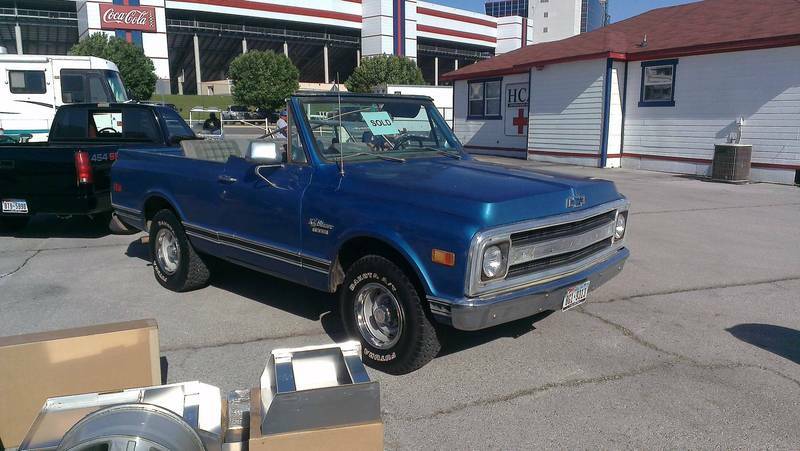 An original paint, unmolested 1970 2wd Blazer 350/4-speed with what looks like only 73,000 miles! I couldn't believe that it hadn't sold by then, but later realized that the guy had just gotten it out of an enclosed trailer, I may have been the first person to see it. I asked him what he wanted for it and was amazed that it was affordable, I immediately called the wife and told her to run to the spot that I was at, I also called a painter buddy and had him meet me there also. Within minutes, I was handing over a 20% deposit to hold it for me until I could get more cash out of the bank. I had no intentions of buying a vehicle there, so only brought enough money for parts shopping. The next morning, I thought I had dreamed that I found the Blazer, so I asked one of my friends if it was real. He replied that he heard it run, so unless we had the same dream it was definitely real. After spending 5 times what I had planned to spend that weekend, I promised my wife that I wouldn't buy anything else for the remaining days that we would be there, although she bought the Blazer a nice cup-holder console that it needed. I love that woman! We were camping at the swap meet and I had pulled our 5th wheel over there not intending to have to trailer anything back, so I had to lean on a couple of friends to get the Blazer back home. 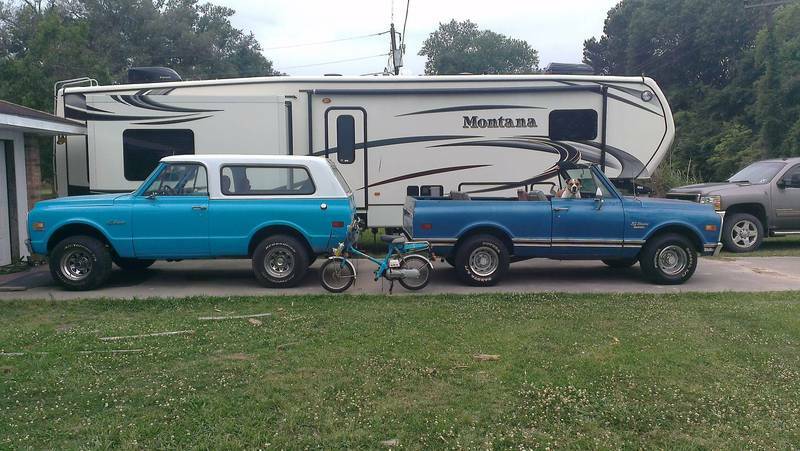 One of them brought it to his house (a little more than half-way to my house), and another one is picking up the Blazer right after lunch today to bring it the rest of the way home. I can't thank Barry & Chris enough for helping me out. In the little bit of time that I have had with the Blazer before it left Pate, we found a few things that need to be fixed fairly soon, like body mounts to get the doors lining up correctly again, and a vent hose on the fuel tank. It had some old fuel in it that we believe is causing it to mis-fire while under a load so I need to drain the tank, start with fresh fuel, and go from there. I didn't even remember to take a bunch of pictures before it left. The plans for this one is to keep it as simple as possible so that it doesn't become a huge project like my truck and end up spending too much time just sitting. I will drop it using an Early Classic 4-6 drop and put on the 17" Ansen slots that I ordered for the other Blazer. I have a set of front buckets that have new foam and seat covers for them that are going in here as well as a rear seat that needs to be recovered. Other than that I will DRIVE it, like what is supposed to happen! It won't be a big build but I hope you enjoy it anyway... I sure will! BTW, Ratchet is my English Bulldog mix, as you can tell from the last picture he has made the Blazer his. 1970 Chevy 2wd SWB "Oscar's Truck"
1970 Chevy 2wd Blazer "Ratchet's Blazer"
2012 Chevy Tahoe LT "Powdered Sugar"
2013 Chevy 2500HD Crew Cab Duramax/Allison Z71 LTZ "Brown Sugar"
Last edited by smbrouss70; 07-28-2017 at 03:40 PM. Nice!!! I'm in the same boat , regret tearing my 70 apart but don't want to rush it so.... I bought a 71 2 wd to get back cruising. Enjoy!! nice find man that blazer is clean! cant wait to see more pics!! Just a fun pic I took yesterday evening while I still have 2 Blazers on the driveway. 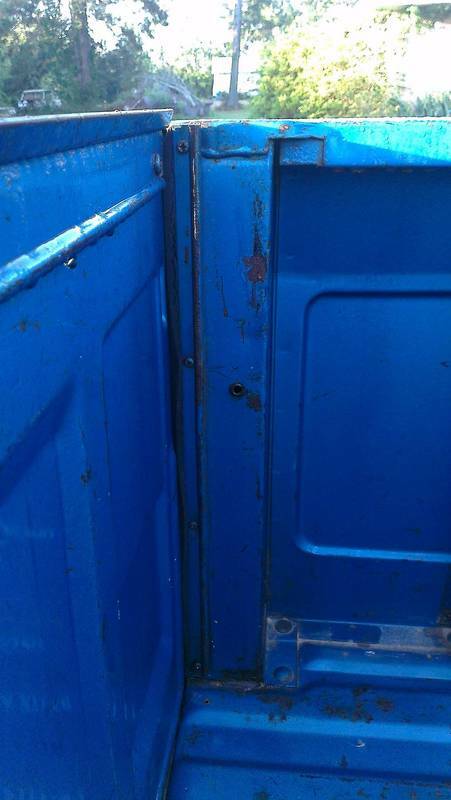 A friend is coming to get the Medium Blue 72 4x4 on Sunday. The scooter is something that my wife picked up at the Pate Swap Meet because she thought it was cute. Who am I to argue? Last edited by smbrouss70; 07-28-2017 at 03:42 PM. I wonder what friend that is? You wouldn't know him, he is in my truck club, but he is truckless right now. Yep, Pate is where dreams come true I love that place..Nice find man..So the 72 already sold? Not at the moment, Lol. I have a question for any Blazer guru's out there. My (Jeremy's now ) 72 4x4 had the rear brackets for the top that extend into the bed area and bolt to the stake pocket box near the tailgate like shown. I already had a double wall top that I am using for the 70 2wd, but it didn't have those brackets. 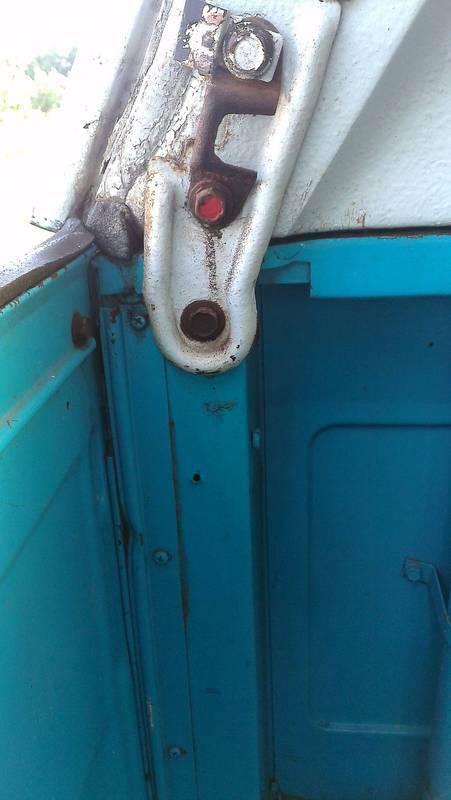 When I looked inside the bed area of the 70 it doesn't have a threaded hole for those brackets. Did the double wall tops not use those brackets from the factory? Should I add them? Last edited by smbrouss70; 07-28-2017 at 03:46 PM. Wow, that is a great question. My 72 has the threaded hole on the right side and NO hole on the left. BTW it's a double wall top. Thanks, never knew that before. Last edited by smbrouss70; 07-28-2017 at 03:47 PM. Very jealous, can't wait to watch this progress. 1964 short step Dropmember, 8 inch step notch ,4 link and running a carbed 5.3/ th400 on 18's an 20's. may drive again some day. I took some time to strip most of the caulking out of the drip rail above the windshield. It looks like I will have to repair a little bit of the windshield frame, but I do have another one that has been sitting in my closet since 2005 so it shouldn't be a problem. I have already talked to Kevin (painter extraordinaire who painted Bowtie468's truck) and we have a game plan for hiding the minor rust repairs. Basically, I will fix all of the problems, then I will spray LizardSkin throughout the interior except for the dash and door surfaces that will be seen, then we will re-spray the interior on top of the LizardSkin in the factory Dark Blue. The bed area will be left with paint showing, and the front will get a rubber floor covering which is what it has now. The seats, console, door panels, and dash pad will be parchment while leaving the sun visors blue (since they stick up above the windshield when the top is off). I will replace all of the weatherstripping on the double wall top, and will use parts of my other double wall top to ensure that the white soft top that I get for it will not have to have holes drilled in my windshield frame. I did find out that I have the wide 70 rear axle, according to my measurements. That means the 73+ rear axles that I have should work for converting to 5-lug as well as the backspacing that was ordered on my wheels. 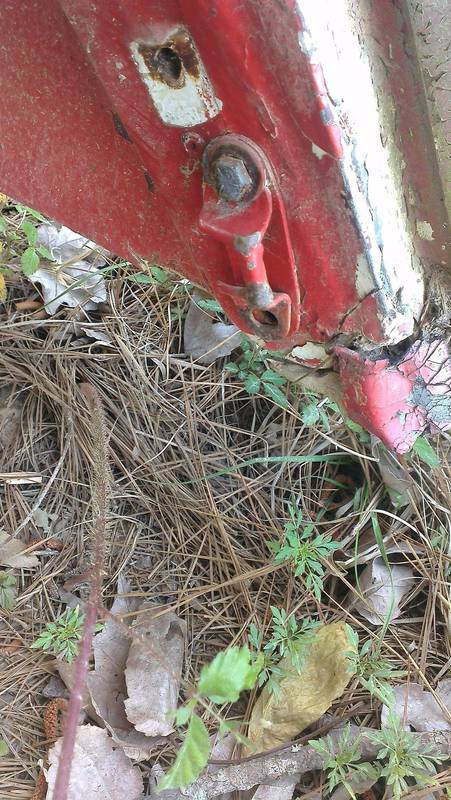 Also, it looks like the Blazer body that I have had in my backyard has the required pieces to add the bracing for the rear seat and passenger seat since apparently my Blazer was bought new with only one utility bucket in the front. I find that this Blazer has a really odd combination of options from the factory. It came from the factory with only a driver's seat, posi-trac rear axle, 350, 4-speed, soft-ray tinted glass, power steering, non-powered brakes, and it was a radio delete truck. It's just weird, but I still LOVE it. Every time I see it sitting in my driveway, it makes me smile. Many of these trucks were custom ordered. Mine was. Im old enough to remember. You sat down with the salesman and checked off a white order form to be sent to the factory. Those were the days when you could get it the way you wanted it. 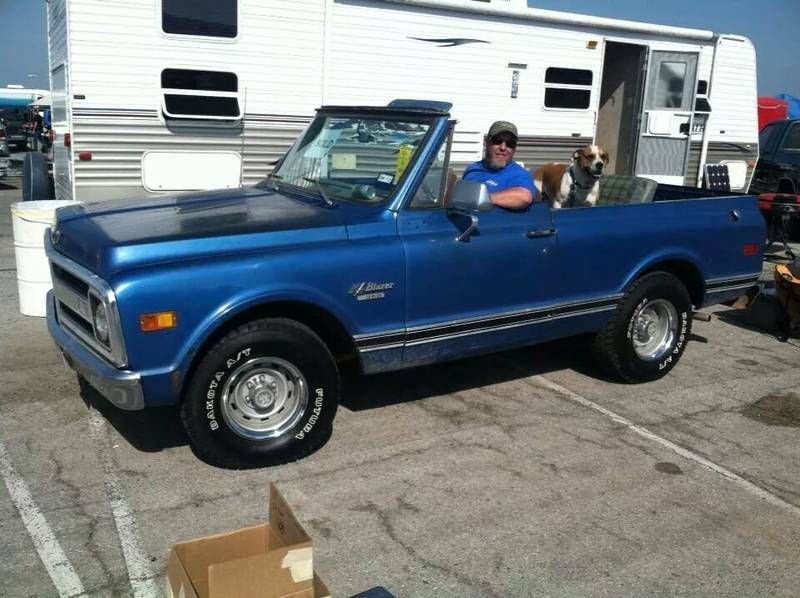 Owner/Admin "TN Classic Truck Club"
It's so cool, I can't wait to see it Cruisin! I call it "Vulgar Display of Power"
It won't be too long Keith, Brandi is making me wait a little bit before I order the drop for it... We kind of need to let the bank account recover after a large unplanned expense. I have been working a lot since I got it so it should be within a month, hopefully. I did find out that it runs real good once it gets good and hot, so I have a direction to work in once I have some time to devote to it. Jeremy already snagged those for the 4x4 that he bought from me. He already paid for them too. You would have to take that up with him. All times are GMT -4. The time now is 11:48 PM.